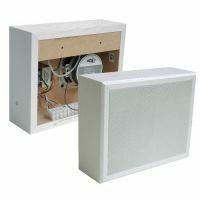 The Kestrel 4 Plus is available in teak and white and has been designed to accommodate an add-on volume control which can be fitted before despatch if required, or supplied separately. (The white unit is also available manufactured complete with volume control.) 4 watt rms output, 100 volt line, cabinet Speaker available in teak or white. 4 watt, 2 watt, 1 watt, 0.5 watt, 0.25 watt and 0.125 watt and power tappings. Furniture quality, with sculptured edges offering both style and protection. User-friendly, self-levelling wall bracket. Safety features include block terminal guards and a hanging block safety strap. Can accommodate an add-on volume control which can be fitted before despatch or supplied separately. The white unit is also available manufactured complete with volume control.